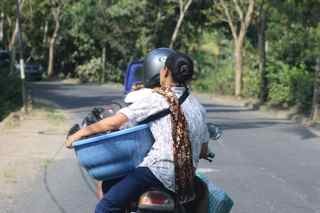 refusing the local taxi operators, and watching the kids in uniforms hop on the back of motorbikes heading to school. I often stop for a coffee at Copper Cafe while ensuring monkeys don’t land on my head from the nearby sanctuary. Sometimes for a treat I have the sweet black rice in palm sugar and yogurt. The nutty rice is soaked for a day then boiled for four hours. Then after a few hours of marking assignments, a girl’s gotta work, I mosie into the centre of Ubud to people-watch and have a $10 massage. Here are a few highlights from my past few weeks. The chef kept telling us (my friend Virginia and daughter Angie visited): “thinner, chop thinner!” Virginia’s hand was aching from chopping! The result is a paste rather than ‘chopped’ veggies. 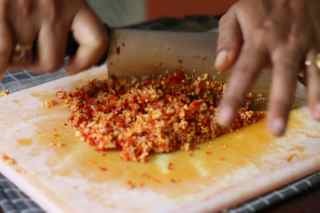 “Indonesian food is simple, but the process is not simple,” says Kadek Suwartini who owns d’waroeng www.d_waroeng.com. Case in point: after shredding raw coconut with a grater, I then squeezed it in a bowl to extract the coconut juice, then strained it. 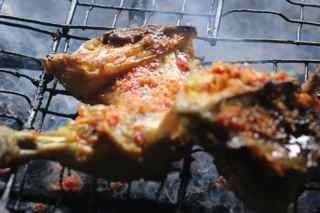 Even cooking chicken wasn’t one step: boil it first in lemongrass and spices, then barbecue in the paste. 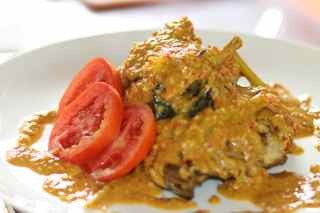 The result: chicken with lemongrass Balinese sauce. The second dish. 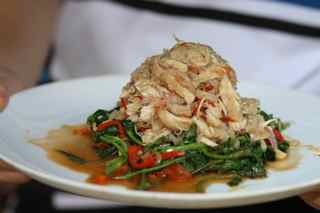 Ayam Sambal Sereh is grilled chicken with lemongrass and fried water spinach. Kadek made me squeeze, with one hand, the chopped onions and peppers. This intensified the flavours. 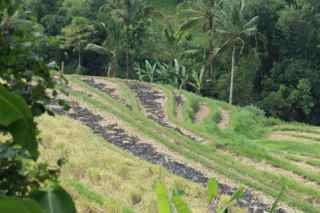 Ubud, in central Bali, is the cultural capital of Bali. 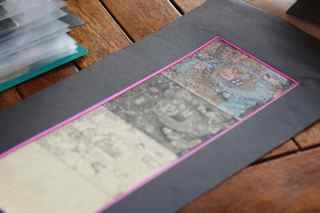 Kadek’s husband draws and paints traditional Balinese art. This four-panel picture shows the labourious process. 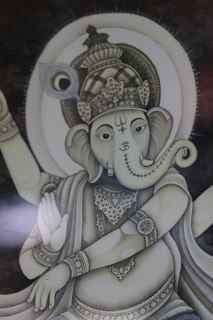 I love Ganesh, the Hindu elephant God who is revered for removing obstacles. 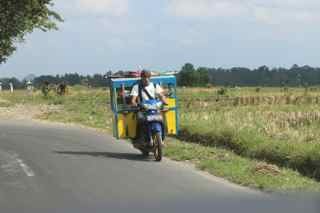 Hiring taxis is the way to see Bali. Public transport is non-existent and the taxi prices are negotiable. 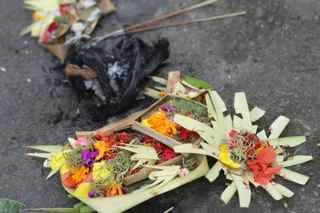 From Ubud, it cost us about $40 for three people for an entire afternoon to hit a few spots. On the east coast it is quiet– Virgin Beach. 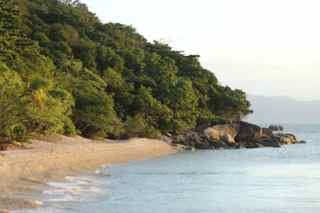 And, you can get a massage on the beach and snorkel. I met Ellen from Holland. We’re heading to Java together this week. Woot Woot. Eating on the table, Balinese style, chicken skewers, green beans with chilli’s and rice. I have been also hiking many volcanoes and tried riding a scooter–just like the locals; however, I have stories I’m writing for publication so you’ll have to wait to hear about those death-defying activities in print! Locals ride with their lives hooked, attached or perched on a bike!